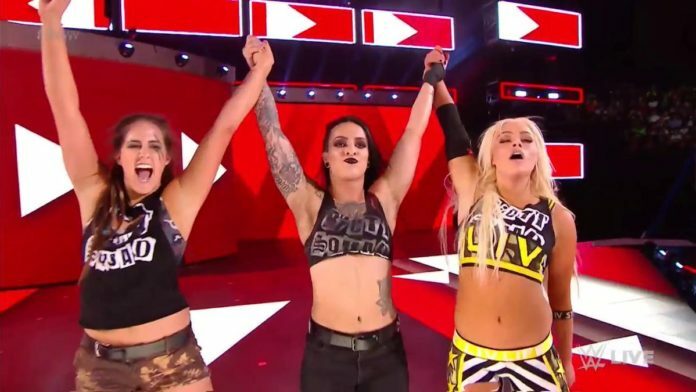 The Bella Twins & Natalya faced The Riott Squad tonight on RAW. Nikki Bella and Liv Morgan started off the match. Nikki took control early and connected with a Backbreaker for a near fall. Brie tagged in and hit Liv with a few Yes Kicks for a near fall. Brie accidentally caught Liv in the face with a kick and then shoved her to the corner. Ruby Riott tagged in and immediately applied a Headlock to Brie in the middle of the ring. Brie broke free and connected with a Dropkick off the second rope for a two count. Everyone got into the ring and Brie, Nikki, and Natalya connected with a triple Suplex that sent The Riott Squad out of the ring as RAW went to a commercial break. When RAW returned, Brie Bella was trapped in the ring as Ruby Riott beat her down in the corner of the ring. Logan and Natalya tagged in at the same time. Natalya connected with a Clothesline and wet for the cover but Ruby broke it. Ruby tagged in as Natalya put Sarah Logan in the Sharpshooter. Ruby then hit Natalya with the Riott Kick for the pinfall victory.